Who didn’t fall in love with that Isabel Marant laced sweater whenever they saw it? I know I still covet that sweater even in this summer heat. However, paying $800 for one sweater is a bit out of my price range, even though I die every time I see it. But thank goodness for knock offs, because as soon as I saw this sweater from NA-KD, I had to get it. It looks incredibly similar to the Isabel Marant one but mere pennies in price comparison. Even though we are heading towards summer, I know I will be wearing this sweater with skirts, cut offs, and even skinny jeans for those June gloom mornings. You’ve already seen the fun, fringed heels from my “Bomber Babe” post, so let’s talk about this amazing clutch (hello, marble mania) and bound cuff from Luxe B. The clutch is actually a makeup bag, but it’s big enough to double as a clutch and you know how much I love a double duty item! Typically I am a gold jewelry person, but this silver cuff is so edgy and so rad, I had to wear it with this outfit. Because I wanted to show off the cuff, I wore it on the outside of my sweater to give it the attention it deserves. I love that laced sweater and it’s great tip to wear the cuff bracelet outside! Yes I am obsessed with this sweater! Have a fabulous weekend too! What a great Look, Christine. 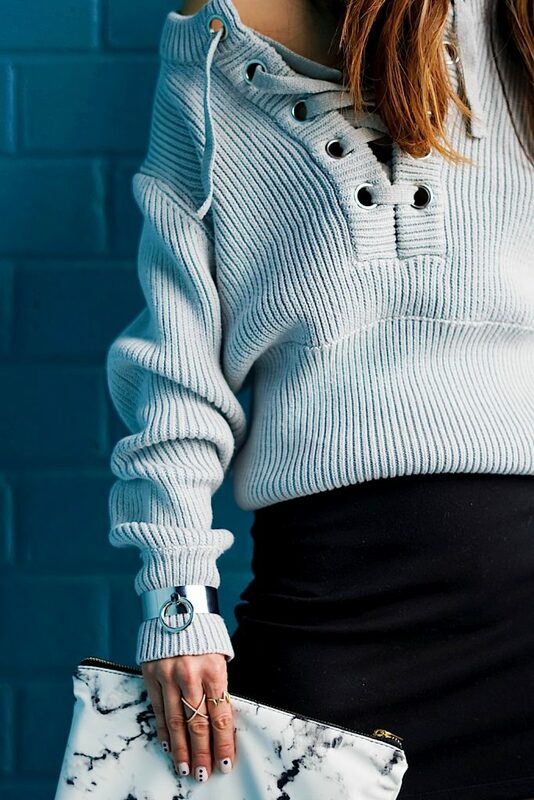 I love this sweater and how you combined it! Thanks Paula. I love an oversized look with something slimmer on the bottom and with this June gloom we are having, this sweater is perfect. Happy Sunday to you too! This is just too beautiful! Love everything about this look! Awww thank you. I’m obsessed with this sweater and have been wearing it nonstop in this June gloom! Great styling! I loved that Isabel Marant sweater, but yeah, a bit pricey for me! Also I love your clutch, so obsessed with marble prints right now! It’s hard to justify an expensive purchase like the Isabel Marant sweater when there are similar sweaters available at such a better price. I am so obsessed with marble (like everyone else) and this clutch is actually a makeup bag so you can use it as either or both! Ugh loving these Isabel Marant vibes SO MUCH! Love this look, Christine. OH MY – i am in love with this amazing sweater! such a great piece and look! Thank you Fiona! Yes I love it and must get it in all of the available colors! This sweater is stunning! Super cute! Thank you Georgina. It’s one of my favorites too!